One of the absolute joys of having grown native plants for close what has to be ten years now is finding some of the more finicky plants reproducing in the yard. It's nice when nurseries tell you the lighting conditions and how much moisture a plant loved but there's so much more to plants than that. What's the moisture supposed to be like over the winter? Do they like sandy soil, rocks, clay, loam? If so, is it just that they're tolerant of it, or is this a soil type they would naturally like to grow in? It's things like this that often leave gardeners wondering why certain plants never establish or do well in some locations. I've found a lot of native plants are drought tolerant, but sometimes that's at the cost of them flowering and or going on to produce viable seed. One of the first natives I planted was a Hepatica acutiloba. Just one. This is a little seedling of that plant that's come up adjacent to that original plant. While I've since moved the parent, I still occasionally find seedlings sprouting up in that location. When I found this species in the wild it was several plants nestled in a rocky slope on the shady bank of a river, just above the flood line. The seeds do have packets of elaiosome on them indicating that ants are the ideal method for planting them, however I've never been able to see this in action even after handing the seeds to the ants! The ants mostly ignore them, except for the invasive pavement ant, Tetramorium caespitum, but I'm 99% certain they'd eat the seeds instead of discard them in the nest for planting. This can happen even with native ant species too, it's just odd I haven't found a species that takes interest in the seeds to this plant. Maybe I'm using the wrong Hepatica species? Something else I find odd is that the plant would produce a hairy stem this early on. I've read that the hair on the stem are to prevent ants from stealing nectar from the flower.... so why is it on a fresh stem, to a leaf, on a first year seedling, that's no where near a flowering age? 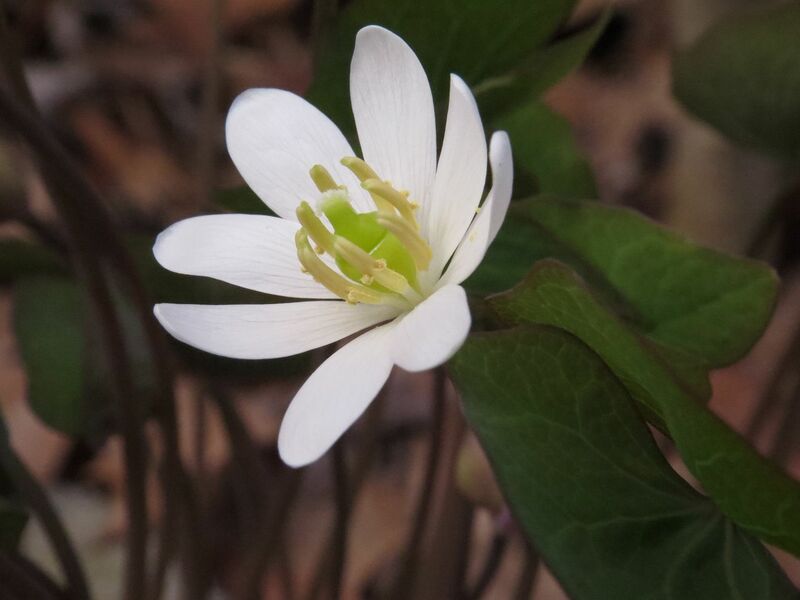 The flowers on adult plants are produced higher early in the spring before any new leaves are pushed out. And speaking of adult plants, the new ones I installed are finishing up their bloom phase. Soon they'll be pushing up new leaves. These flowering stems will lose their petals and slowly lean outward as the star-like cluster of seeds develops. When they're ready, the star of seeds basically falls apart. (I wonder if the seeds have to be wet for ants to take interest in them as the elaiosome isn't stored in a pod.) Another theory as to why the ant seed dispersal hasn't worked is the lack of cross pollination. Well this year I've seen mason bees working the flowers on sunny mornings so I might be able to rule that out, assuming they don't require a specialized pollinator. Another page in the joys of seeds walking away from me comes in the form of Trilliums. 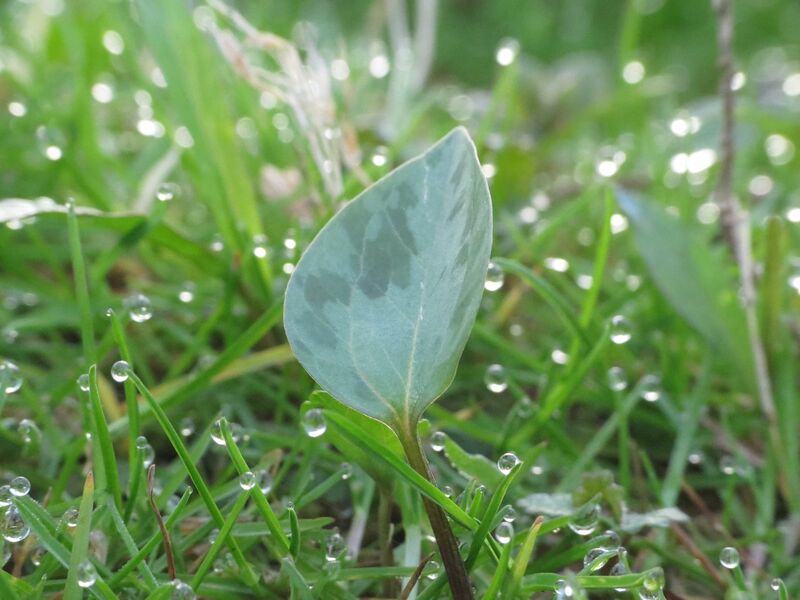 Here a new Trillium seedling has pushed up its first leaf right in the lawn. (Either that or its a Pikmin) Thankfully it's a shady spot that never needs mowing, and also they're pretty easy to transplant. I've been growing Trilliums for years now so it's great to finally see this occurring. Many of the Trilliums I've been growing have either diminished in root size or otherwise fluctuated between good and bad years but never really expanded. I believe this was because the soil wasn't healthy enough for them to really establish well thus their population stayed steady. Something that I started doing was allowing the leaf litter to stay on the flower beds I had Trilliums planted in. It's taken forever but finally the leaf litter has mulched itself in and I'm starting to see the established plants doing a lot better. Some of the smaller plants that never flowered before are dividing like crazy this year. I've got at least two plants that are pushing up a dozen stems, and even some of those have blooms on them. They're still pushing through the soil so I don't have an exact count but I'm impressed with the progress. Another issue I was having was, some species weren't getting enough moisture over the summer months. So they'd come up and flower pretty but they couldn't maintain a seed pod once the summer heat set in, and watering them didn't seem to be helping much either. The leaves looked like they were cooking in the sun almost, despite the full shade conditions. I've since transplanted these to a different garden bed and they seem to do okay, though I won't know for sure until I see them flower and seed this year. At any rate they're getting more shade and are closer to the hose now. 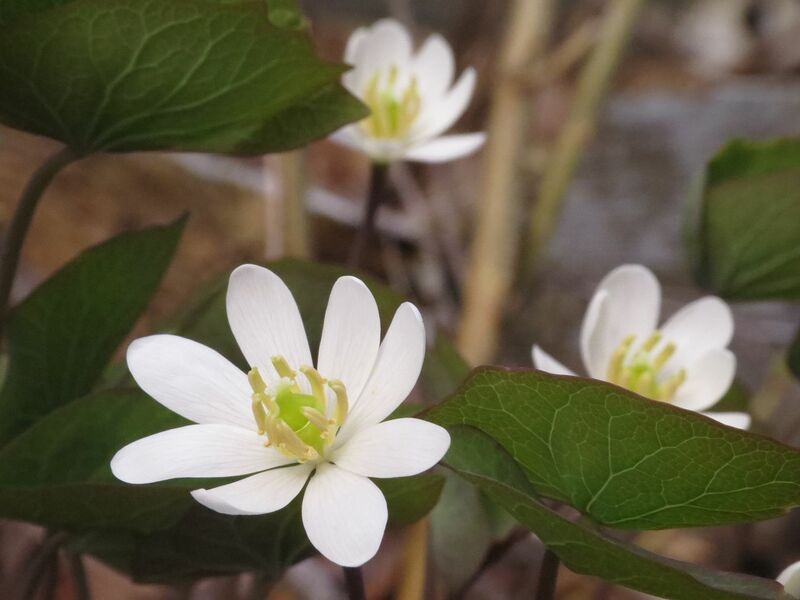 Jeffersonia diphylla, Twinleaf is the other gardening triumph this year. I started with three plants, only one of which would flower. 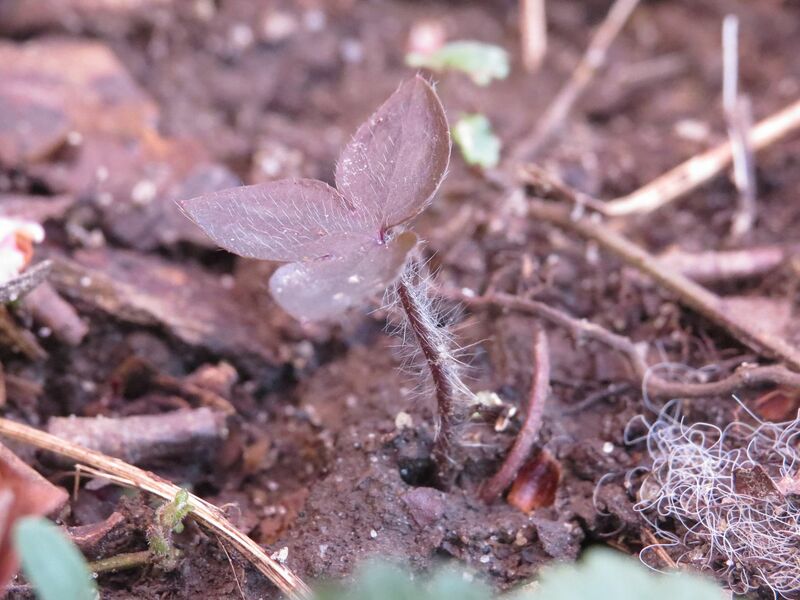 I was having the same issue where some years I'd lose the seed pod to lack of watering over the summer so I decided to move the one that flowered into a wetter flower bed and it died! The other two I basically ignored until last year when I noticed one flowering. It had a single bloom on it if I recall and this year it's produced eight! This is one of the hardest wildflower to find flowering in the wild. From the time the blooms open you have roughly 8 hours to 2 days to see them and get your pictures in. Something as simple as a windy day will make them drop their petals and that will be it for the year! Because of this, pollination, and especially cross pollination isn't that common. I'm not sure that cross pollination is necessary to produce seed but I've heard it does help the plant make larger packets of elaiosome to entice more ants to transplant the seeds. My fingers are crossed that the seed pods develop because I'd rather not risk transplanting them again. I've since found a wholesaler for Twinleaf, and Trilliums, and I'm reasonably happy with the product they sent me this year. It's just great seeing plants I've established are also trying to save me money. according to Carol Gracie in her awesome book Spring Wildflowers of the Northeast, ants are only interested in elaiosomes the very day or the day after they are produced. If they dry out or age at all they will not touch them. 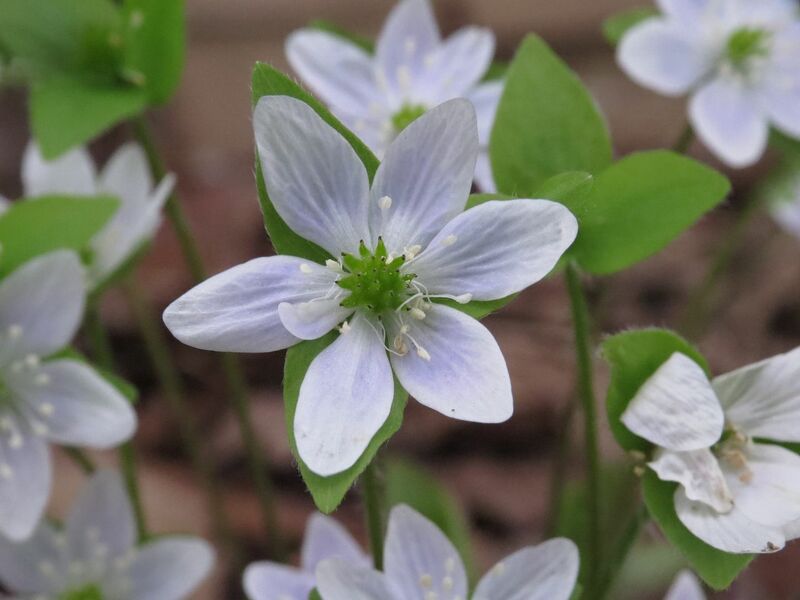 Also, hepatica flowers are fuzzy to protect them from cold temperatures in early spring. The hairs on the stem and leaf makes perfect sense now, thank you. However, I'm still having trouble figuring out the elaiosome part with this particular plant. If you look at the flower, there's that pokey ball shape that forms in the middle; each one of those points is a seed, that whole structure just breaks apart and the elaiosome sides are just connected facing inward. It seems to me they must dry out days or weeks before the seeds ever hit the ground. Perhaps I'm going to harvest seed too late to get ants to take interest.